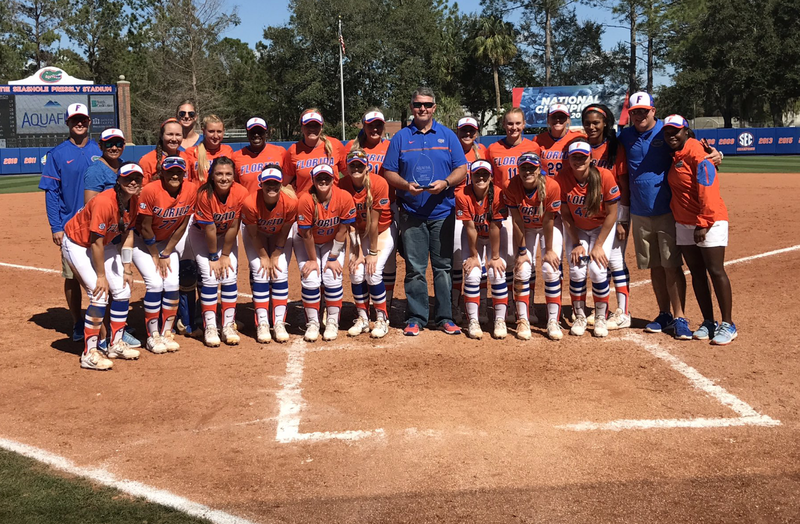 GAINESVILLE, FL- The Florida Gators softball team hosted the Aquafina Invitational at Katie Seashole Pressly Stadium this weekend. After earning their first #1 ranking of 2017, the Gators went 4-1 in the five games played as part of the tournament. Florida defeated FAMU 8-1 Friday afternoon before defeating Northwestern State 9-3 in the back end of the doubleheader. The Gators fell to Maryland Saturday morning before blanking Northwestern State. Florida completed the weekend with a 5-0 victory against FIU. Florida jumped out to a first inning 3-0 lead as Kayli Kvistad hit an RBI single scoring Justine McLean. Nicole Dewitt later scored when Jaimie Hoover walked with the bases loaded and Chelsea Herndon singled Kvistad home. In the fourth inning, Amanda Lorenz singled then stole second. Dewitt scored after the throwing error by FAMU’s catcher Denise Anderson. Kelly Barnhill pitched four innings for the win, allowing 3 hits and striking out 11 batters. Katie Chronister finished the game for the Gators, pitching the final three innings and earning her first career save. The Gators moved to 8-0 with a late Friday win against Northwestern State. Aleshia Ocasio didn’t have her best stuff, but Florida’s offense was able to power past the Demons with a 9-3 victory. Ocasio’s final line included 4 innings pitched, five hits allowed, and gave up three runs, all earned. Ocasio struck out four without walking a batter, before Delanie Gourley took over. Gourley gave up one hit and struck out three over the final three innings to get the win. Florida jumped out to a 3-0 lead after four innings. Kvistad hit a two-run home run in the first inning, and Ocasio scored on a Sophia Reynoso double in the fourth. Northwestern State scored three runs in the top of the fifth to tie the game, but Florida would go on to score six runs in the bottom of the sixth to win. Florida finally suffered their first loss and this one hurt. Florida had loaded the bases on consecutive errors by the Terrapins defense, but then the rains came causing an hour and a half rain delay. When the game resumed, Florida seemingly lost momentum and the first two batters were retired without a single run scoring. Florida jumped to a 2-0 lead after Ocasio singled. Dewitt scored on the play and Kvistad was able to score on a throwing error. Maryland came back in the fourth inning and took a 3-2 lead. The Terrapins would tack one more run on in the fifth inning. This was the first win of the year for Maryland, who had lost all eight previous games they’d played. Florida followed their loss to Maryland with a 10-0, run-rule victory over Northwestern State. Barnhill led the Gators by pitching a one-hit shutout, her second of the young year. Barnhill struck out nine and walked four on the afternoon. Florida scored an early run when Kvistad doubled to left, scoring Dewitt. Florida scored three runs in the fourth and tacked on three more in the fifth inning. Jordan Roberts hit her first home run in the fifth inning with her two run shot to center. Sophia Reynoso went three-for-three including a triple in the fourth inning. Kelly Barnhill improved her shutout streak to twenty-four by pitching 5.2 innings of three-hit ball. Barnhill struck out 12 while walking four of the twenty batters he faced. Senior Delanie Gourley finished the game for the Gators with 1.1 innings of perfect baseball. Florida scored four runs on Jaimie Hoover’s second career grand slam. Ocasio, Kvistad, and Dewitt scored on the homer. All three Gators hitters reached base on two-out walks. Kvistad added one run in the top of the fifth with an RBI double to left that scored McLean.